This temple, also located near Basavanagudi, is well known for its remarkable architecture. 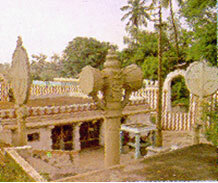 The Gavi Gangadhareshwara temple is one of the oldest temples in Bangalore. Legend has it that the cave temple dates back to the Tretha Yuga. Kempegowda built two of the oldest temples in Bangalore: the Bull temple and the Gavi Gangadareshwara Temple. The temple, dedicated to Lord Shiva and Goddess Parvathi is inside a natural cave in Gavipuram. Legend has it that Kempegowda built this temple in gratitude after being released from his five-year imprisonment by Rama Raya. Devotees gather here on Makara Sankaranti day when it is believed that at a particular moment in the evening the sun’s rays fall directly on the linga inside the cave, passing between Nandi’s horns. The temple, which roughly covers an area of 300 ft by 200 ft, was renovated during the period of the local chieftain Kempegowda, who is also known as the founder of Bangalore. This dates the temple back to nearly 500 years. The 14-pillared Mantap of the temple has elements of the Vijayanagar style of architecture. does the temple have Shiva and Parvathi together at the same place or are they in different prathishtas? i have visited this temple many times. i liked this temple a lot, its an very temple, iam visiting this temple from my childhood. Its as it is now also. But have to take care of inside sagnets water places. Iam visiting this temple from my childhood…. Its superb n v can see the places i mean itz short cut for “shivagange” and “siddagange” temples..
Iam visiting this temple from my childhood…. Its nice n v can see the places i mean itz short cut for “shivagange” and “siddagange” temples..
Do they conduct weddings here?